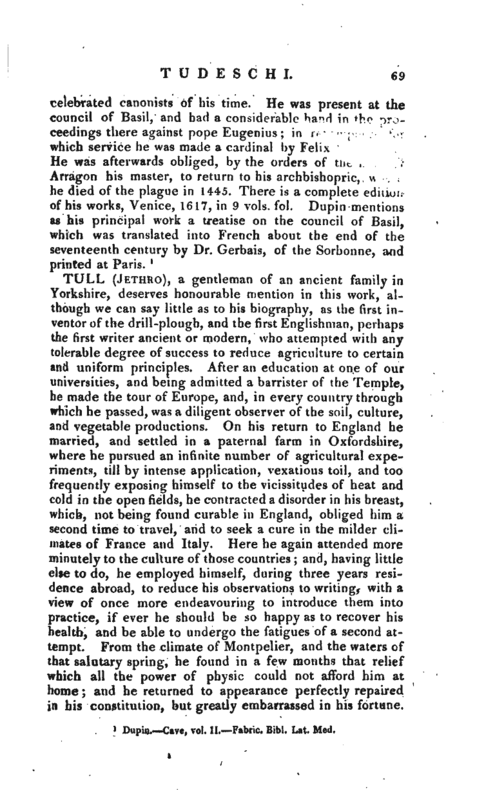 , a gentleman of an ancient family in Yorkshire, deserves honourable mention in this work, although we can say little as to his biography, as the first inventor of the drill-plough, and the first Englishman, perhaps the first writer ancient or modern, who attempted with any tolerable degree of success to reduce agriculture to certain and uniform principles. After an education at one of our universities, and being admitted a barrister of the Temple, he made the tour of Europe, and, in every country through which he passed, was a diligent observer of the soil, culture, and vegetable productions. On his return to England he married, and settled in a paternal farm in Oxfordshire, where he pursued an infinite number of agricultural experiments, till by intense application, vexatious toil, and too frequently exposing himself to the vicissitudes of heat and cold in the open fields, he contracted a disorder in his breast, which, not being found curable in England, obliged him a second time to travel, and to seek a cure in the milder climates of France and Italy. Here he again attended more minutely to the culture of those countries; and, having little else to do, he employed himself, during three years residence abroad, to reduce his observations to writing, with a view of once more endeavouring to introduce them into practice, if ever he should be so happy as to recover his health, and be able to undergo the fatigues of a second attempt. From the climate of Montpelier, and the waters of that salutary spring, he found in a few months that relief which all the power of physic could not afford him at home; and he returned to appearance perfectly repaired in his constitution, but greatly embarrassed in his fortune. | Part of his estate in Oxfordshire he had sold, and before his departure had settled his family on a farm of his own, called Prosperous Farm, near Hungerford in Berkshire, where he returned with a firm resolution to perfect his former undertaking, having, as he thought, devised means during his absence to obviate all difficulties, and to force his new husbandry into practice by the success of it, in spite of all the opposition that should be raised by the lower class of husbandmen against it. He revised and rectified all his old instruments, and contrived new ones proper for the different soils of his new farm; and he now went on pretty successfully, though not rapidly, nor much less expensively, in the prosecution of his new system. 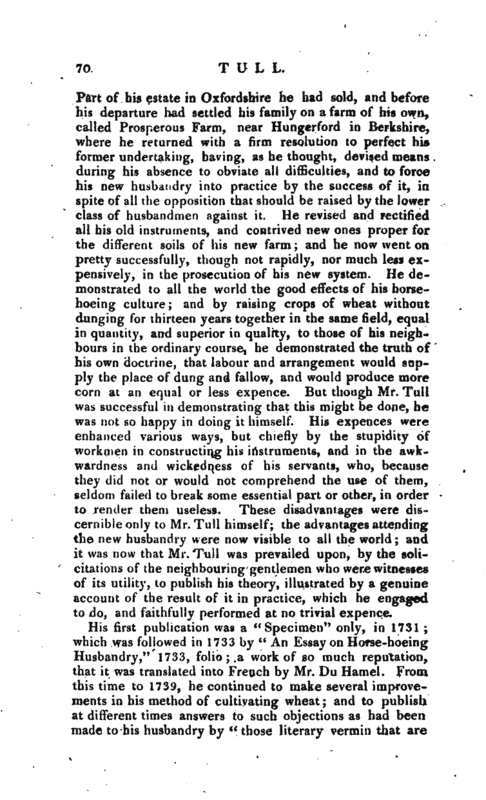 He demonstrated to all the world the good effects of his horsehoeing culture; and by raising crops of wheat without dunging for thirteen years together in the same field, equal in quantity, and superior in quality, to those of his neighbours in the ordinary course, he demonstrated the truth of his own doctrine, that labour and arrangement would snpply the place of dung and fallow, and would produce more corn at an equal or less expence. But though Mr. Tull was successful in demonstrating that this might be done, he was not so happy in doing it himself. His expences were enhanced various ways, but chiefly by the stupidity of workmen in constructing his instruments, and in the awkwardness and wickedness of his servants, who, because they did not or would not comprehend the use of them, seldom failed to break some essential part or other, in order to render them useless. 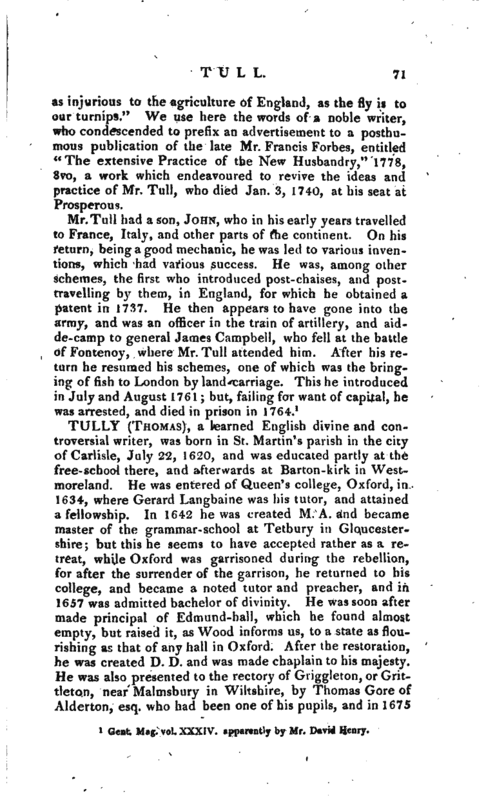 These disadvantages were discernible only to Mr. Tull himself; the advantages attending the new husbandry were now visible to all the world; and it was now that Mr. Tull was prevailed upon, by the solicitations of the neighbouring gentlemen who were witnesses of its utility, to publish his theory, illustrated by a genuine account of the result of it in practice, which he engaged to do, and faithfully performed at no trivial expence. Gent. Mag. vol. XXXIV. apparently by Mr, David Henry.